If you’re looking for a premium four-channel Serato DJ controller in the sub-US$1000 range, the Pioneer DJ DDJ-SX2 should be at the top of your list. Having said that, if you’re the owner of a DDJ-SX, there may not be enough on the DDJ-SX2 to warrant dropping serious cash just for extra buttons and a brighter / tighter jogwheel, unless you want to get on Serato DVS of course. In this review we take a look at the new features found on the Pioneer DJ DDJ-SX2, the update to the popular DDJ-SX Serato DJ controller released a few years back. The DDJ-SX2 looks almost identical to the DDJ-SX, save for a few cosmetic changes: first is the centre ring of the jogwheels, which now show cue countdown markers. The next is the addition of three buttons for Serato Flip functionality straight on the unit itself. There are also new coloured backlit performance pads for easier recognition. Lastly, the “Dual Deck” buttons, which let you select either channels 1 and 3 or 2 and 4 simultaneously, have been removed – you just press both deck buttons now to enable Dual Deck mode. The DDJ-SX2 works with Serato DJ, so I just hooked it up to my laptop, connected my speakers, and got to work. There are four main new features here on the DDJ-SX2: the updated RGB backlit performance pads, the buttons for Serato Flip, the new jogwheel centre display, and compatibility with Serato DVS. The DDJ-SX2 has new RGB backlit pads that mimic the hot cue colours you’ve set in Serato DJ. The performance pads here are now RGB backlit pads as opposed to the “Pioneer blue” that was in the original DDJ-SX. The colours mimic those that you’ve set within Serato DJ, so you can colour code your hot cues for quicker recall and recognition in a dimly lit booth without having to glance at your laptop. Not a deal breaker for most, but this is certainly a feature that’s nice to have, especially if you like placing a lot of cues in your songs – I love doing this for festival shows because it lets me jump to parts of a track if I feel like cutting to the drop or extending a breakdown. The DDJ-SX2 has dedicated controls for Serato Flip, letting you record, playback, and store Flips straight from the controller itself. Another new feature on the DDJ-SX2 is a matrix of buttons dedicated to Serato Flip. Serato Flip is an add-on feature that lets you create routines or edits, called Flips, using hot cues or the censor button – you hit the Record button to tell Serato to record a Flip. You then perform the cue jumps (or hit the censor button if you want to remove some cuss words), and then save it in a Flip slot. You can then play these back either as a one shot pass or as a loop. You could do all of these on your laptop of course, but it’s quicker to do on the DDJ-SX2 since you’ve got all the controls you need in order to record, perform, store, and playback your Flips in proximity on the device itself. Apart from enhanced sensitivity to the jogwheels themselves for lower latency and more accurate scratching (according to Pioneer DJ, at least), the centre displays of both jogs have also been upgraded to include red cue point markers and a cue countdown timer in the middle. These are visual aids that could be handy for scratch DJs, letting them maintain their focus on the controller (like looking at a record and a sticker you’ve placed on it as a marker) instead of having to stare at a laptop screen. Out of the line of Pioneer DJ DDJ controllers, I think the DDJ-SX2’s jogs are easily the best in terms of tightness without sacrificing portability. The DDJ-SZ, whose jogs are similar to CDJ size, comes in a form factor that often feels too bulky for smaller bar gigs with tiny booths, while something like the DDJ-SR or DDJ-SB2 just lacks the premium feel and onboard display of the DDJ-SX2 that make it a joy to use. The DDJ-SX2 fills in the gap between the two, and Pioneer DJ has done a stellar job on these jogwheels. The DDJ-SX2 is Serato DVS ready, meaning if you purchase the add-on you can hook up your turntables or CDJs and DJ with timecode vinyl or CDs. Lastly, the Pioneer DDJ-SX2 is capable of being upgraded with Serato DVS, letting you hook up a pair of turntables or CDJs to use timecode vinyl or CDs respectively. The original DDJ-SX had phono/line inputs on channels 1 and 2, however it doesn’t have Serato DVS compatibility, they’re purely meant for use in “Thru” mode. This turns the DDJ-SX2 into two things: a full-featured controller for Serato DJ first, and then an interface for using vinyl or CDJs with Serato DJ second. If you can’t decide whether or not you’d want to use a controller while ditching turntables or CDJs altogether, or if you just like having the flexibility of DJing with the greatest number of control mediums, the DDJ-SX2 can become the heart of your digital DJ system, provided you’re set on using Serato DJ as your software of choice. If you’re looking for a premium four-channel Serato DJ controller in the sub US$1000 range, the Pioneer DJ DDJ-SX2 should be at the top of your list. There’s no reason not to get this over the original DDJ-SX because of the aforementioned new features (unless you’re getting a deep discount), and especially if you’re set on using Serato DVS which is one of the main draws of this unit. Having said that, if you’re the owner of a DDJ-SX, there may not be enough on the DDJ-SX2 to warrant dropping another thousand bucks just for extra buttons and a brighter / tighter jogwheel. If you’ve got the DDJ-SX and would want to try Serato DVS, maybe a less expensive option like the Akai AMX two-channel mixer would be a more practical choice, at least until Pioneer DJ comes out with the next major update to this model. Want it? Click here to buy it on Amazon. Some controllers do carry alot of cosmetic fakery…I can see why turntablists take the piss! A spinback should never be in your effects section…it’s disgusting! thanks! was waiting for this review ever since the RX was announced…. thin I might jump Traktor and go fully to Pioneer. But i am curious about their dvs approach… i guess we will see it sometimes in the next few months! Ill wait for that before i choose the S8 or this one! How do the effects work with external devices like turntables? Only the colour FX or also the beat FX? Hi all, is it possible with this Controller to run as well with Serato ? 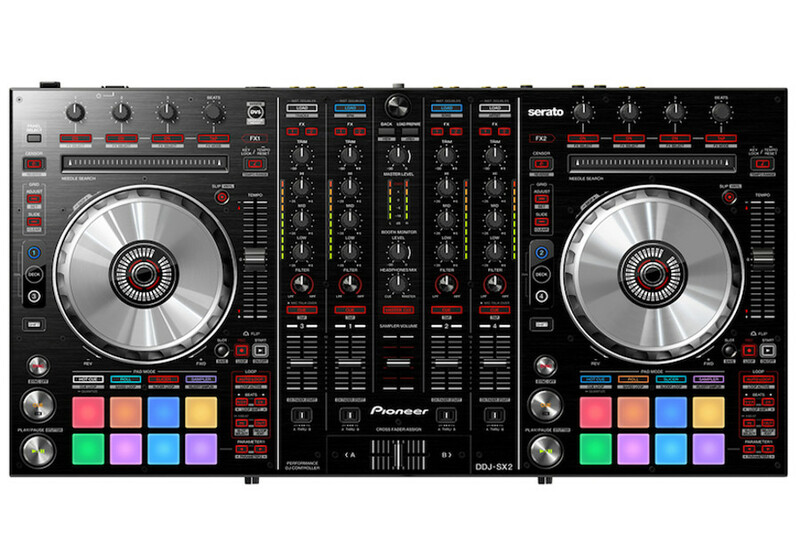 If not, it’s may be the better choice to select the DDJ SX2 which can run in Serato and with Recordbox. Downside would by the extra Charge for Record Box 4 and the missing extra knobs for Recordbox only Features. Especially at the beginning of Recordbox as a full featured DJ Software I feel definitly uncertain which pioneer Controller to choose. No, this doesn’t work with Serato DJ. Am really feeling this controller, this or the sx2 not sure which to take as they are both same but find this one more classy and professional looking! It’s a great controller, though the main difference between the two is compatible software: Rekordbox vs. Serato DJ. Choose that, and the gear decision will be easy 🙂 Let us know what you pick! Hi great review Steve. I’m currently a Serato user and considering moving to recordbox, perhaps with this controller. Do you know if recordbox and Serato will coexist quite happily with each other on the same laptop, or is this not a good idea? I should also add that the laptop is a MacBook Pro running OS X 10.9.5.